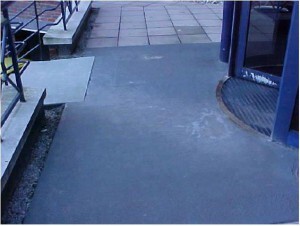 TreadSafe® treads and decking play a key role in ensuring safe access for visitors and employees at the headquarters of a leading national charity for disabled people. Set up in 1977, the Motability Scheme has provided over four and a half million Motability vehicles and has helped millions of disabled people and their families to enjoy the ‘road to freedom’. The Motability scheme helps disabled people and their families to become mobile by enabling them to use their Government-funded mobility allowance to lease or buy a car, powered wheelchair or scooter. The Harlow-based headquarters has a steady stream of visitors, many of whom are disabled. The company’s raised building comprises three wings with underground parking. Access to the rear of the building is by three external metal staircases which were originally covered with non-slip paint. However, the stairs were in constant use and open to the elements, so the paint became loose and started to flake which was dangerous. Overtime the problem was compounded by a spell of icy weather that meant the stairs remained slippery despite the use of grit and salt. The TreadSafe® installation was bolted onto the existing staircase and landing which comprised a series of pre-drilled bespoke treads and specially-engineered half-moon shapes. These were manufactured from 1.5mm stainless steel with a medium profile abrasive grit temperature bonded to the surface and finished with weatherproof paint. 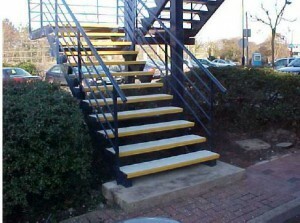 This made the stairways completely safe for all users. To meet the requirements of the Disability Discrimination Act 2004, the treads and half-moon shapes also featured a highlighted leading edge.